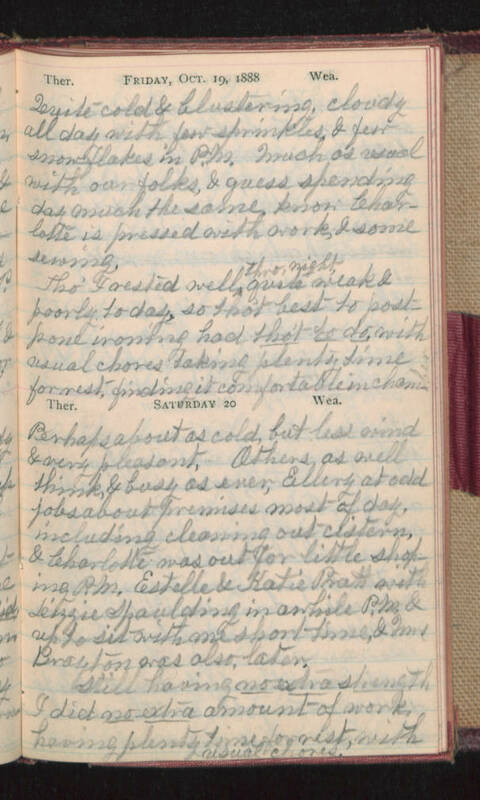 Friday, Oct. 19, 1888 Quite cold & blustering, cloudy all day with few sprinkles, & few snow flakes in P.M. Much as usual with our folks, & guess spending day much the same, know Charlotte is pressed with work, & some sewing. Tho' I rested well thro night, quite weak & poorly today, so tho't best to postpone ironing had tho't to do, with usual chores taking plenty time for rest, finding it comfortable in chamber. Saturday 20 Perhaps about as cold, but less wind & very pleasant. Others as well think, & busy as ever, Ellery at odd jobs about premises most of day, including cleaning out cistern, & Charlotte was out for little shopping P.M. Estelle & Katie Pratt with Lizzie Spaulding in awhile P.M. & up to sit with me short time, & Mrs Brayton was also, later. Still having no extra strength I did no extra amount of work, having plenty time to rest, with usual chores.